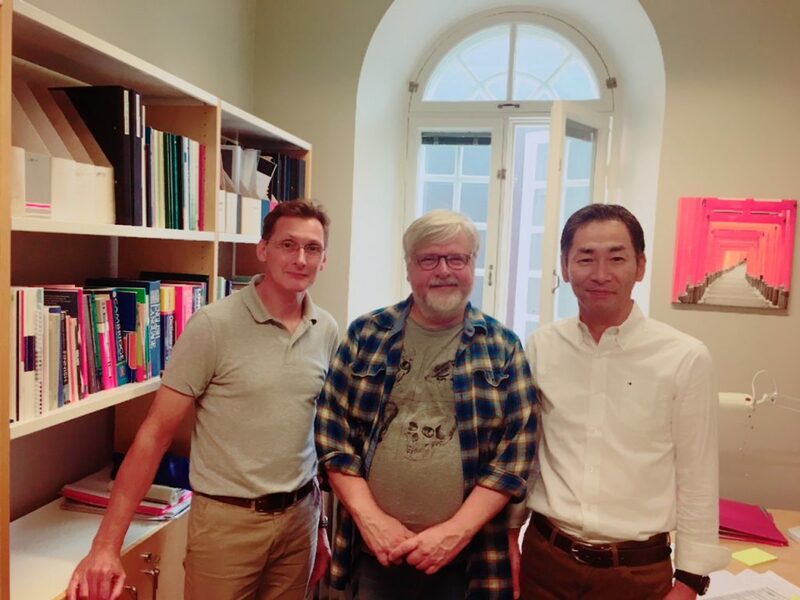 In August 2018, Professor Jun Iwata from the School of Medicine of Shimane University in Japan visited the English unit of our Language Centre on his way to Eurocall conference in Jyväskylä. As a teacher of English for medical purposes to Japanese students, he was very interested in our “Academic and Professional Communication in English” courses for the students of the Faculty of Medicine. Roy and Kari shared materials with him and discussed the similarities and differences in teaching English to medical students in Finland and in Japan. In this discussion, we covered a variety of issues including the structure and materials of our respective courses, e-learning tools used in the courses and the English language levels of our students. Based on this discussion, and further supported by a poster presented by Holá et al. (2018) at theXV CercleS International Conference, the most striking differences are in our aims and approach to teaching the students. Namely, our approach focuses more on productive, communicative skills rather than reading and listening, grammar and lexicon. There are several potential reasons for this, including the high starting levels of our students in their English language skills, the general availability of everyday language resources such as undubbed television programmes in English, the language of course textbooks and other materials, cultural reasons and traditions in teaching languages and what we, the language teachers, see as our function in supporting the students. Based on Pitkänen (2018), what we do is clearly in line with both the current and future academic and professional needs of our students. We have clearly moved on from teaching medical terminology and grammar as a means to support their studies to developing their wider communicative skills English. Here in Finland, students develop their knowledge of discipline-specific terminology by reading brick-sized course textbooks in English. In Japan, medical course materials have been translated into Japanese to assist the learning process of the students. However, this means that the teaching of medical terminology in English remains the task of language teachers. Prior to this millennium, the aims and context of English teaching in Finland resembled those of Japan. However, the role of English in Finnish society has radically changed. Instead of a focus on learning terminology and on receptive skills in general, English has now become an essential tool for academic and professional communication, and this evolution is reflected in language teaching (Pitkänen 2018). We also have a long tradition of providing alternative means for students to acquire their English language skills (Siddall & Pitkänen 2011). Currently, this includes portfolio testing and the integration of language teaching with English-medium problem-based learning modules taught by the faculty. As a whole, meeting language teachers from other countries provides us with an interesting window to other potential ways of fulfilling our role – and a great tool for self-reflection. Based on what we have seen, we can still feel quite good about what we have achieved so far and where we are currently heading. Naturally, we can still develop both our approaches and how we implement them in language teaching. In this, taking a closer look at what others do is extremely beneficial. Holá, Alena, Tamara Kopriková & Katja Kulhánková. Poster on “English vs Latin in ESP for Medicine presented at the XV CercleS International Conference, Poznan University of Technology, Poland, 6-8 September 2018. Iwata, Jun, John Clayton & Sara-Jane Saravani (2017). Learner autonomy, microcredentials and self-reflection: a review of a Moodle-based medical English review course. Int. J. Information and Communication Technology 10 (1), 42-50. Pitkänen, Kari K. 2018. From a reader/listener to a speaker/writer: Student views confirm the need to develop English courses further towards productive, interactive skills. Language Learning in Higher Education, CercleS 8(2). (445-468) https://doi.org/10.1515/cercles-2018-0023. Wallinheimo, Kirsi and Kari K. Pitkänen 2016: iPads in medical language courses at the University of Helsinki. Language Learning in Higher Education, CercleS 2016 6(1). (77-94) DOI 10.1515/cercles-2016-0004. I’ve just returned from the 11th International Symposium on Bilingualism (ISB) held at the University of Limerick (12-15.6.17). The theme of the event was “Bilingualism, Multilingualism and the New Speaker”, and it was a truly international event, with almost 1,000 delegates from all over the world. As you’d expect, the delegates were a diverse crowd, with researchers from different fields of linguistics, language teachers, and policy makers, discussing many different aspects of language learning and language use. This made it very interesting professionally, but also personally as there was a lot about migrants learning languages as adults, bilingual kids and heritage language speakers – all relevant topics in my life! With a conference this big, it’s difficult to give an overview of everything that went on, but some of the hot topics were the idea of plurilingualism and the practice of translanguaging. These refer to the idea that the different languages you know and use are not completely separate systems, but rather they make up your personal linguistic repertoire that you draw on as needed. As always, the terminology is confusing and evolving, but there are implications in these ideas for our teaching and assessment practices. For example, how do we engage with, develop and evaluate our students’ linguistic repertoires rather than just their English skills, which can’t really be seen on their own and out of context? Being multilingual is the norm rather than an exception. ‘One nation, one language’ is not a very accurate concept. Bilinguals include all those who use two languages (to a fairly fluent level), not just those raised with two as children. While very important, the language(s) we learn as children is(are) not necessarily all important – language skills, including those in our mother tongue, develop (and sometimes regress) throughout the lifespan! The term ‘new speaker’ refers to someone who learns and then actively uses a language later in life. The idea is to have a more positive way of viewing these multilinguals – they are not just non-native speakers. There’s a special emphasis on those starting to learn minority languages, but this could also apply to immigrants, for example. Finally, a few highlights and some useful links. Brian North on the new CEFR descriptors which are out this summer – more details here. Apparently they are explicitly moving away from thinking of language up as reading, writing, listening and speaking, and the four skills will/should be production, reception, interaction and mediation. Monica Schmid on Language attrition (and bilingualism) – nice blog and a great speaker. Welcome to the blog of the English Unit at Helsinki University Language Centre! These sites give a good overview of the Finnish education system and, thus, of a good number of the students we teach, as they have gone through the system.